Modern American sports have been shaped by some remarkably influential figures - men and women who have profoundly impacted the games and, in many cases, transcended them. What would basketball be like without Bill Russell? Football without George Halas? Golf without Arnold Palmer? What if William Randolph Hearst hadn't introduced the newspaper sports section or Charles McNeil hadn't introduced the gambler's point spread. What if Hank Luisetti hadn't pioneered the jump shot or Marvin Miller hadn't spearheaded free agency? 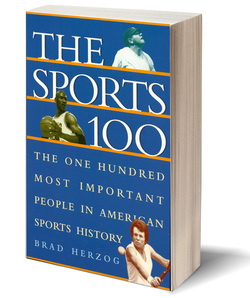 Through hundreds of hours of research and discussions with dozens of sportswriters, authors, historians, librarians, athletes and coaches in virtually every athletic arena, Brad Herzog came up with a ranking of THE SPORTS 100. In more than 400 pages, he profiles figures ranging from Bill France (#41) to Bill Veeck (#69), from Red Grange (#20) to Red Auerbach (#84), from Jim Thorpe (#21) to Jim Bouton (#100). It's a controversial list. No Kareem? No DiMaggio? No Hogan? But then, that's the point. In the end, The Sports 100 is as diverse as sport itself. There are athletes and innovators, activists and academics, executives and inventors, journalists and judges, agents and outcasts, pioneers, producers, promoters and presidents – all of whom made a lasting impact, in one way or another, on American athletics. Of course, you are bound to disagree with many of the selections and omissions. But like the old argument about New York’s greatest centerfielder, it’s all a matter of perspective.